Even though the tragicomic neo-Western Slow West follows a simple, straight-line A-to-B quest, it still feels scattered. That’s partially because first-time writer-director John Maclean takes a classic “more interested in the journey than the destination” approach to the story. Callow but well-heeled 16-year-old Jay Cavendish (The Road’s Kodi Smit-McPhee) is crossing America to reunite with his lost love Rose (Caren Pistorius), who fled their native Scotland with her father John (Rory McCann) after a Jay-related incident made them wanted criminals. But Maclean never gives viewers any reason to believe Jay will find a warm welcome if he does find Rose again. Their love connection, the urgency of his travel, and the rightness of his end point may all be entirely in his mind. Jay himself is deeply invested in their reunion, but the film itself is only invested in what he encounters en route. His most significant encounter teams him up with tough mercenary Silas Selleck (Michael Fassbender), who takes one look at Jay’s dude-gear, unlined face, vampire-pale skin, and shaky hands, and marks him as a victim in the making. He demands a high fee for serving as Jay’s guide and bodyguard, even though the biggest threat to Jay is actually Silas’ old criminal compatriots, led by the dissolute but serious-minded Payne (Starred Up’s Ben Mendelsohn). But while Fassbender plays his character as a classic Western hero—tough, calm, a crack shot, knowledgable about the terrain, and stern in a way that betrays little weakness—he’s more equipped for hardship and violence than for the twee quirk that awaits him. Slow West often feels like the Coen brothers’ rendition of True Grit, if they’d brought Wes Anderson in as a collaborator. It’s a shaggy-dog story full of colorful characters and aimless but diverting narrative byways, all delivered with Andersonian solemnity, against a backdrop of deeply saturated colors and meticulously dressed sets. Lines like “In a short time, this will be a long time ago” suggest that Maclean isn’t taking the story as gravely as his tone implies. So do nudge-nudge comic moments like the one where a bleeding man sees something personally devastating at the same moment he literally gets salt in his wounds. There’s significant tragedy in Slow West, but it comes with a bitter belly laugh, and a sense that humanity is so ridiculous, in 1800s Colorado or anywhere else, that a certain wryly philosophical outlook is as necessary for survival as any skill with guns and horses. 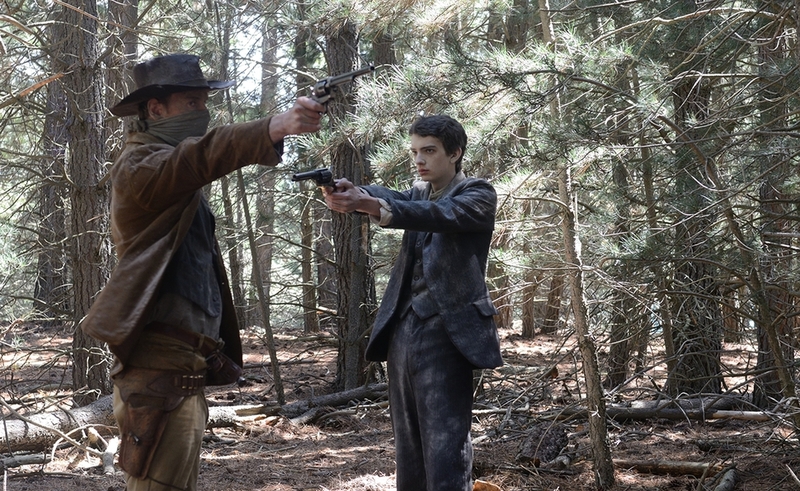 Wes Anderson, the Coens, and John Ford Westerns aren’t the only touchstones in Slow West. There’s a fair bit of Jim Jarmusch’s Dead Man in the film’s DNA, with Jay as the Jarmuschian outsider bearing witness to a parade of horrors, from a Union officer murdering Native Americans for sport to a desperate Swedish couple attempting robberies at gunpoint. There’s even a surreal Jarmuschian musical interlude involving a group of Congolese singers, and an intense dead-of-night conversation with a traveling anthropologist named Werner, clearly modeled a bit after a certain filmmaker who shares his first name. Sidebars into a Jungian nightmare and a tall tale told by one of Payne’s gang members, about a young criminal desperate for his own wanted poster, heighten the sense of narrative detachment and lack of urgency. Like Dead Man, this all feels like a sleepy bedtime fable, a ghost story being told long after all the protagonists are dead. But Slow West also mirrors Liev Schreiber’s sole directorial project, the 2005 Jonathan Safran Foer adaptation Everything Is Illuminated, in which a pale, too-serious young man enlists an eccentric local guide for a beautifully shot but unsettlingly artificial journey into an unfamiliar country. Like that film, Slow West winds up in a beautiful house in a beautiful field, with both the setting and the events there feeling like something out of a particularly arch and stagey play. Fassbender and Mendelsohn’s note-perfect performances, pitched for an earlier era and a less postmodern script, are the only really grounded aspects of the film. Mostly, it comes across as a sandbox adventure, with an artificial finish line placed on a story that’s mostly about playing with all the strange and interesting narrative toys littering this familiar landscape.